The Police Command in the Federal Capital Territory ( FCT), Abuja says it has taken into custody two of its officers who allegedly killed an officer of the Nigeria Security and Civil Defence Corps (NSCDC) in Nyanya area of the city. Late Ogar Jombo, an Assistant Superintendent of the NSCDC, was killed in the presence of his wife and children, when he was stopped by the policemen for alleged violation of traffic rules. The Commissioner of Police in the FCT, Mr Bala Ciroma, who confirmed the arrest and detention of the officers to NAN, said that investigation was ongoing to unravel the cause of the incident. 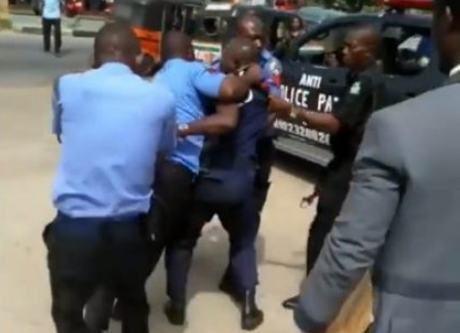 “There was a fracas between the senior officer and the policemen, we have commenced investigation and we will not know what really happened until after the investigation,’’ CP Ciroma said. Late Jombo was taking his children to school in the morning when the unfortunate incident occurred.